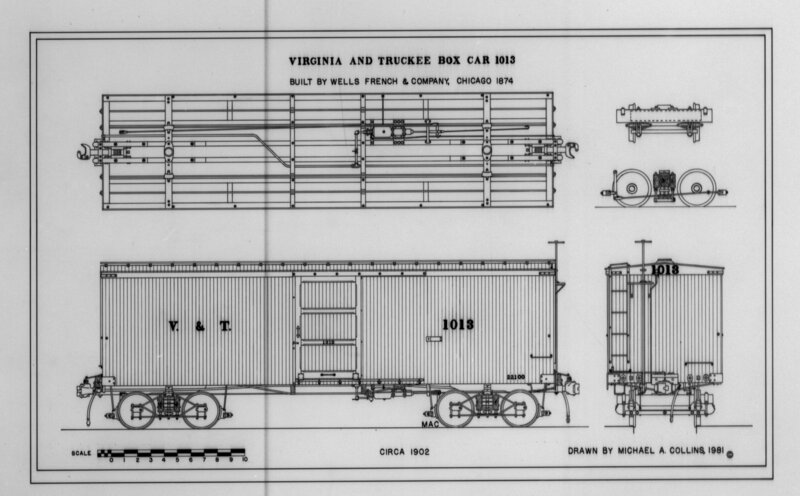 Primarily an ore and lumber hauling railroad, the Virginia & Truckee required merely a handful of boxcars for their own use. Only eight such cars were on the road during its lifetime and they were used mostly to transport hay, grain and general merchandise. Of the eight, only six cars remain today, four of which are housed in the museum. Boxcar No. 1013 was one of two built expressly for the V & T by the Chicago based firm of Wells, French & Co. in 1874 at a cost of $758. When completed, the 21,000 lb. wooden frame cars measured 34 feet 1 inch long, 9 feet wide and 14 feet high. It first entered service in June 1874 and was capable of carrying 30,000 lbs. of freight. No. 1013 carries the distinction of being the first piece of V & T rolling stock to be equipped with the Sams “automatic” link and pin couplers in 1897. These were replaced by more modern Tower automatic couplers in 1902, along with an automatic air brake system. After the construction of the 15 mile line to Minden in 1906, No. 1013 was moved to the terminus and served as a temporary office and quarters for the station agent. With the completion of the station facilities, No. 1013 returned to the active roster. In 1909, after more than 30 years of active service, the boxcar was completely rebuilt, including new siding and additional safety features, to extend its serviceable life until 1938. In that year, Paramount Pictures purchased the car for a roll in their film “Union Pacific”. Although it was deliberately wrecked in the picture, the studio repaired the ex V & T car and reduced the roof height by several inches to match its other railroad equipment. When not in use, No. 1013 was stored at the Union Pacific Railroad yards in East Los Angeles. It last saw movie work in 1958. Following a rapid succession of sales in late 1971, from Paramount to Old Tucson Studio to Short Line Enterprises to the State of Nevada, No. 1013 was trucked to Mound House. Here the boxcar remained in storage under the jurisdiction of the Nevada Division of State Parks until 1977 when it was brought to the new V & T facility at Carson City. Legislative action in 1979 conferred ownership of the 105 year old relic to the Nevada State Museum. Three years later the boxcar was reconstructed, utilizing four of the six original underframe sills, several purlins and all of the old cast iron components. 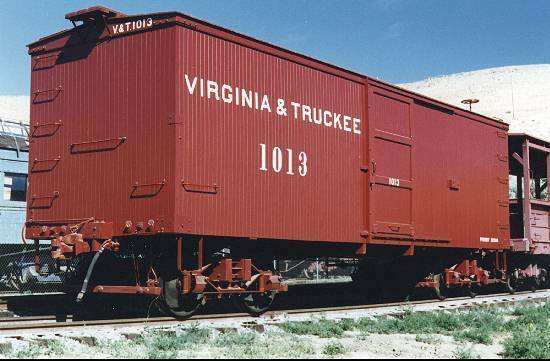 After almost three months of painstaking work by Short Line Enterprises beginning in December of 1981, V & T boxcar No. 1013 now reflects its appearance soon after the 1909 rebuilding.